I am Marcie Thompson from Little Rock, Arkansas, and I enjoy quilting. I started quilting in the early 1980's thanks to my friend Ruth Enoch's interest in learning. Fortunately my teacher started me off with good hand piecing techniques which have helped me with the exacting work which is necessary when making intricate blocks. I also learned to quilt at a time when most people hand quilted. Therefore though the trend now is toward machine quilting, I still enjoy quilting many of my pieces by hand. I made quilts through the early 1990's when machine quilting became popular. I was overwhelmed and intimidated by the work being done by many designers, so I stop making quilts. The only quilt I worked on until 2003 was a quilt top my grandmother Stella Boyce had made before 1954. My Uncle Walter asked me to quilt the top for him. 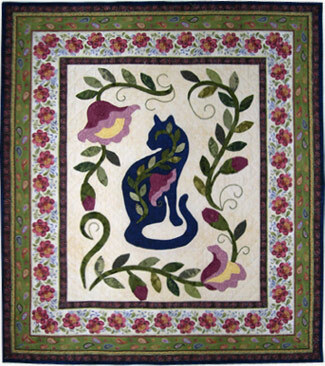 Early in 2003 my friend Mary Robertson was working on a small quilt but didn't enjoy the quilting part so I volunteered to finish it for her. And I was rehooked. After making three wallhangings that year I decided to join a group making the Dear Jane® quilt. And so I started what I call my Jane Journey which not only brought me back into the world of quilting but opened me up to new friends and a new way of thinking. Quilting friends and quilting groups, guilds, or clubs are essential to expanding your ideas of what quilt project to work on next. When I started my Dear Jane® quilt I could only think of working on one thing at a time. Now I have overlapping projects because I want to do so many different things. Quilting friends challenge you. And my new way of thinking - I don't have to equal the work done by anyone else. I can take pleasure and satisfaction in the work I am able to do at this moment and continue to challenge myself to improve and expand my abilities.